^ Hotels near Wembley. [2016-11-03]. ^ Timeline: The new Wembley. BBC News. 21 February 2006. 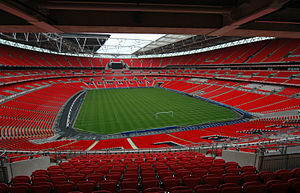 ^ Wembley to break even by 2015, says FA chairman. BBC News. 5 October 2011. ^ Projects : Wembley Stadium. Populous.com. ^ 6.0 6.1 6.2 6.3 Wembley Stadium, London. Design Build Network. 19 June 2006 [11 August 2010]. ^ Tottenham Hotspur on Twitter: "We’ve reached agreement with @WembleyStadium to play our @ChampionsLeague fixtures there for the 2016/17 season. https://t.co/BPCGmW1mrQ"
^ Tottenham Hotspur on Twitter: "…The agreement additionally provides an option to play all @PremierLeague & cup home games at @WembleyStadium for the 2017/18 season. 2/2"
^ 10.0 10.1 Wembley kick-off: Stadium is ready and England play first game in fortnight. Daily Mail. 2007-03-09 [2007-03-19]. ^ Wembley Stadium Uses. Wembley National Stadium Limited. （原始内容存档于2010-09-24）. ^ Wembley arch due for completion. BBC News. 16 February 2004. ^ "A beautiful new home for the beautiful game"
^ Wembley truly special - architect. BBC News. 2006-02-13 [2007-03-19]. ^ Doors finally open at new Wembley. BBC News. 2007-03-17 [2007-03-19]. 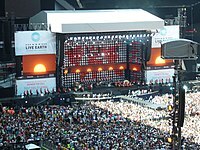 ^ 21.0 21.1 21.2 21.3 21.4 21.5 21.6 21.7 21.8 Wembley Stadium - Presspack - Facts and Figures. Wembley National Stadium Limited. [2007-03-19]. （原始内容存档于2008-05-16）. ^ 'Steel the key' to extra time. BBC News. 2006-02-21 [2007-03-19]. ^ Premiership clubs eye transfer to Wembley. ^ NFL regular-season game in London a hot ticket. Associated Press. 2007-05-16 [2007-05-21]. ^ W is for London. metallica.com. [2007-03-19]. （原始内容存档于2007-03-22）. ^ 29.0 29.1 England U21s draw Wembley cracker. BBC Sport. 2007年3月24日 [2007-03-25]. ^ Exeter 1-2 Morecambe. BBC Sport. 2007年5月20日 [2007-05-20]. ^ Can Derby stay in the Premiership?. BBC Sport. 2007-05-29 [2007-06-05].